Las Vegas, Summerlin, other area residents, and visitors prepare to experience the wildest slip and slide in the world. Take an exhilarating trip down a 1,000 feet vinyl water slide, through the streets of Las Vegas. This vinyl slip and slide is 1,000 feet long from start to finish (that is approximately the length of three football fields). The slide is padded, so it feels like you’re floating down a fluffy cloud. It is fully protected to ensure your safety. It’s going to be a great day to get out and enjoy the sun and the party. Slide the City provides the slide and the water; you provide the laughter and fun. To see more things to do in Las Vegas, click here. Different pricing packages ensure affordability and a way for the entire family to come out and enjoy the day. 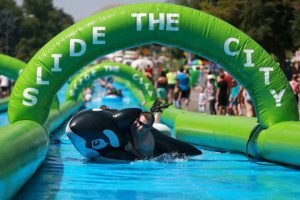 Everyone is required to bring their own tube, or purchase one of the tubes Slide the City will be selling on the day of the event. The Single Slider Package: You get a wristband that allows you to slide down the slip and slide one time during the day. With the wristband, you will also receive a water gun and mouth guard, and a few other special gifts. The Triple Slider Package: Your custom wristband gives you the opportunity to ride the slide three times, at any time during the day. With this special purchase, we include a tube, a mouth guard, and water gun, for your squirting pleasure. The VIP Slider Package: This is the best package of all. 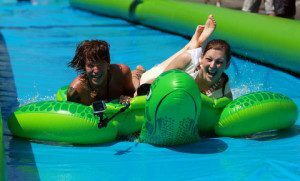 Only VIP purchasers will be able to slide one hour prior to when the slide opens to the public and an hour after the slide closes to the public. In addition, with the purchase of a VIP Slider Package, you can take a ride on the wild, slippery slide as many times as you want during the day. We also give you a deluxe gift bag with a mouth guard, upgraded water gun, vinyl tube (remember: a tube is required to ride the slide), a t-shirt, and hat. This is without a doubt the best package, do not miss all the fun, and buy the VIP Slider Package. This is an all day, family-friendly day playing in the water. We encourage you to bring your own water buckets, water guns (yes, you can shoot bystanders and other tubers), floaties, and anything related to water play. And, don’t forget your swimsuit or wear clothing that you want to get soaked in. There will be vendors providing food, but you can also bring your own snacks. There will also be live music and lots of dancing in the streets. This is the best thing to happen to asphalt since they painted new lines down the middle of the street. 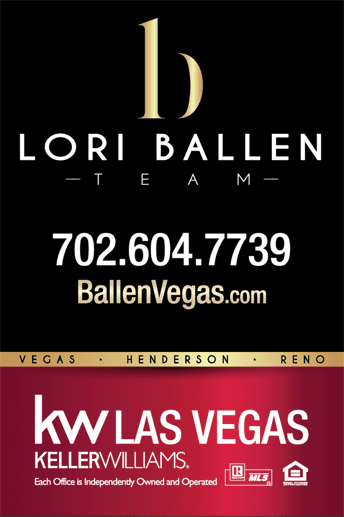 Contact The Ballen Group at 702-604-7739 for information on homes for sale in The Vistas, Summerlin. 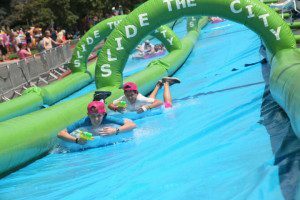 Slide the City in Las Vegas starts at noon on the day of the event and ends at 5:00 pm. For those that purchase a VIP Slider Package, you be will be able to start sliding at 11:00 am, and stop at 6:00 pm. It is best to purchase your packages in advance. Once you arrive at the slide, go to the registration tent to check-in. You will get your goodie bags and wristband for whatever package your registered online for. Or, purchase your day of event wristband at the registration tent. If you don’t have your wristband, you will not be able to ride, so hang on to it. For your convenience, busses and bikes will be available to get your to the event. You can also drive, but be prepared to walk a bit to the slide. No cars will be allowed down by the slide for obvious reasons. There is a height and age limit for the safety of all; you must be over 46 inches tall or over 5 years old, and if under 18, you need to have a legal guardian sign a waiver of liability. This is just to ensure the safety of everyone at the event. Slide the City provides a special lane for kiddos to go down with their parents, although they must go down on separate tubes. Get ready, cause Slide the City is coming to Las Vegas and it is a water party you won’t want to miss. So come out and share in the family fun event that is sure to put smiles on the faces of all those attending. Slip and Slide to your hearts content. For more information, please visit the site: http://www.slidethecity.com/events/las-vegas/.